In this article we'll be working within the Address Book module to make changes to settings for adult contacts. 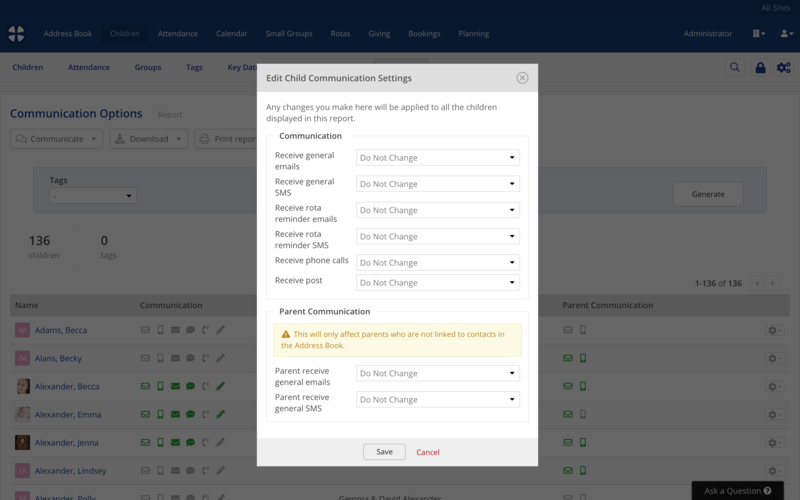 The same process with similar functionality also exists in the Children module for managing the communication options for children. Before making bulk changes to people's communication options or privacy settings, you should ensure you have a lawful basis for processing the changes. For example, under the EU GDPR, compliance is when people are opted out by default and should only be opted in where there is an appropriate lawful basis, typically this would be with the person's consent. 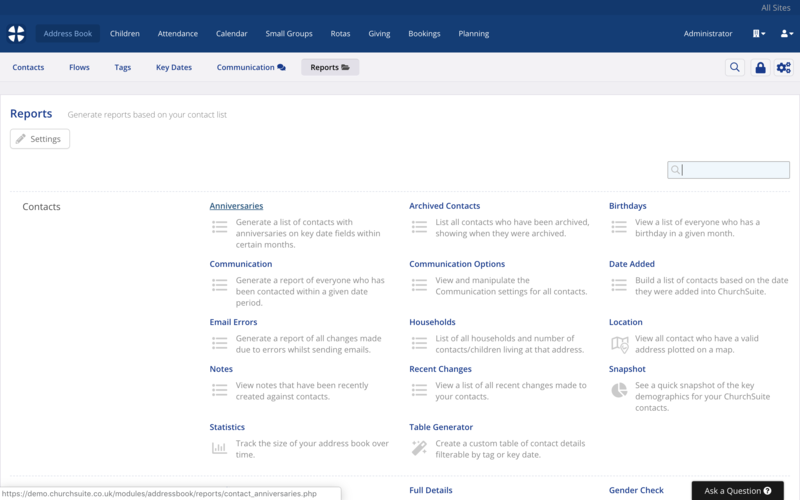 Locate the Communication Options report in the Address Book module's Reports section (or Children module > Reports, for children). The report shows you the current Privacy settings and Communications options for all your contacts (or children), and also whether a person has My ChurchSuite Login enabled; and allows you to change them. Here's what the Children module's Communication Options report looks like. There are no Privacy settings for the Children module as My ChurchSuite is only currently for adult contacts in the Address Book. Note that the Parent name and Parent Communication options are included. 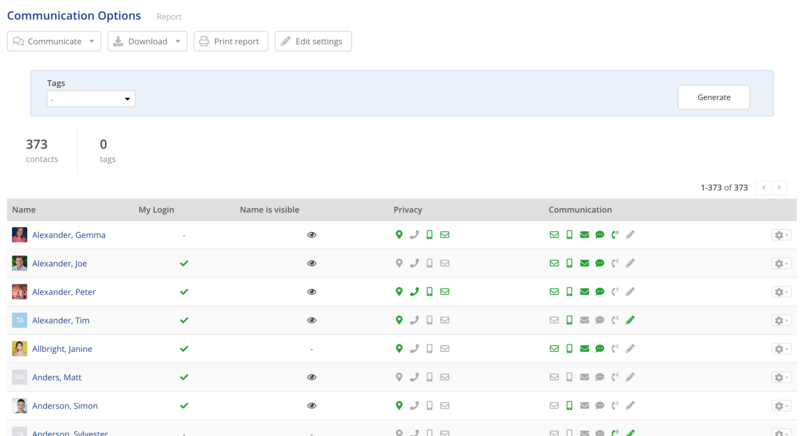 By default the report displays a list of all active people for the module being viewed. Using the report's filters, you can optionally filter the list by one or more Tags, allowing you to visualise and update the privacy settings and communication options set just those tagged contacts. Click Generate whenever you change the report's filters. 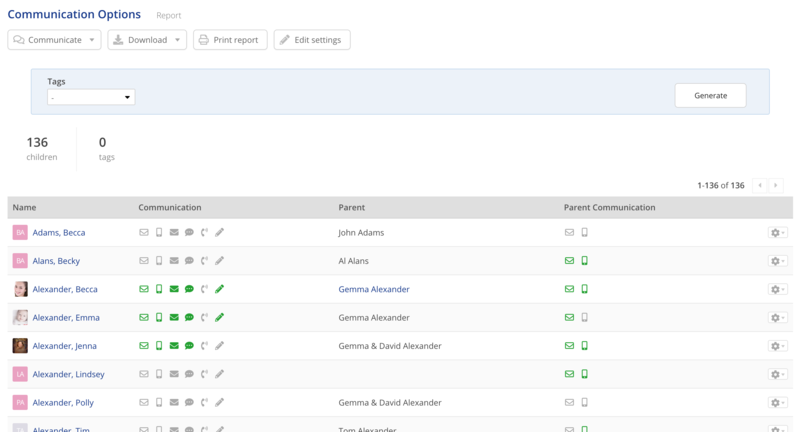 Having filtered the report to display just the contacts or children for whose privacy settings or communication options you wish to edit, click the Edit settings button at the top of the page. The settings you are about to change will only be applied to all contacts or children currently being viewed - either all contacts (or children), or a filtered list based on the tags selected. Before proceeding with changes, check that you are viewing the intended list of people! The Edit Contact Communication Settings (or Edit Child Communication Settings) pop-up is displayed. 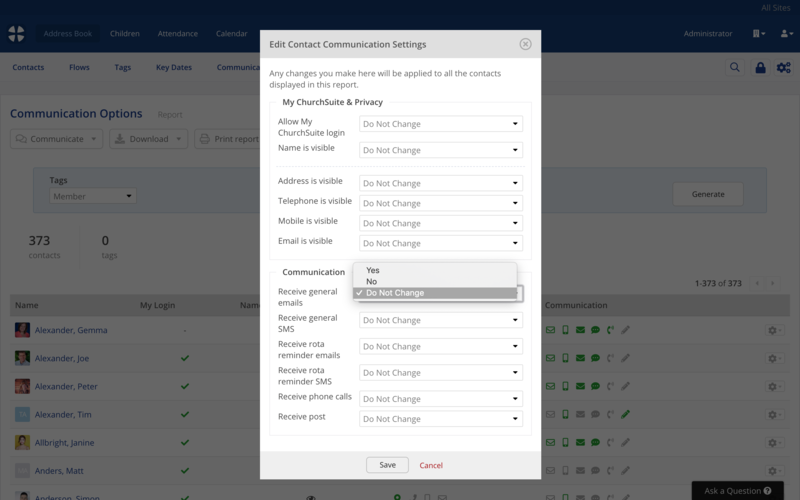 For each communication and privacy option you can now select whether each person's current option setting should be changed to Yes, No, or Not Changed. For example, if you only want to update Name is visible to Yes, you would leave all ther other settings as Do Not Change. Therefore, working down the list of options, select the appropriate response from the drop-down list - the default is to not change the current option value that each person in the list already has. For children communication options, note that linked parent communication options are edited using the Address Book Communication Options report - therefore only parent communication options for unlinked children can be edited here within the Children module report - i.e. only those children whose parents don't exist in your Address Book, and are instead recorded against each unlinked child's profile. Once you are happy, click Save to update the communication options and privacy settings for all the people listed in your report. Where a person's settings have been changes, a Changes log will be added against each person's profileand is visible in the Recent Activity section in the respective module.